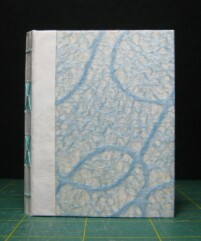 Lastly, I’ve finally gave in and bought volumes 1 to 3 of Keith Smith’s bookbinding books (the ‘bibles’ of non-adhesive bindings) and his “Bookbinding for Book Artists”, so watch for future experiments posted here. 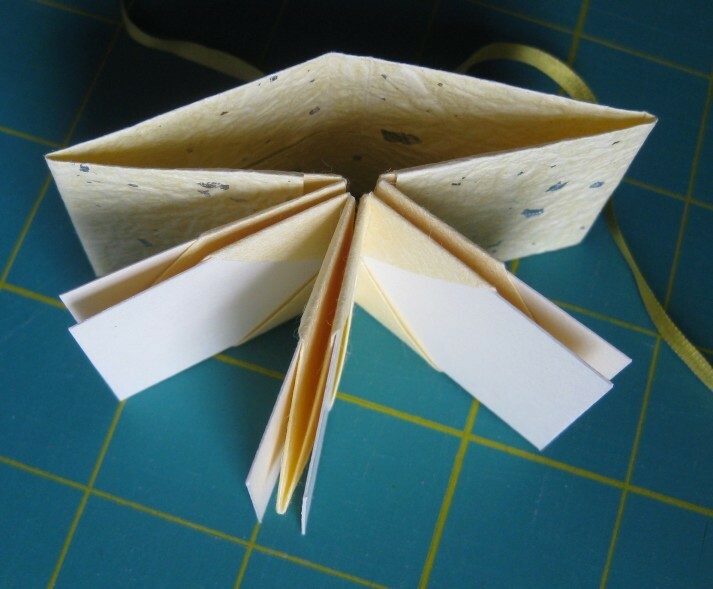 For quite a while I’ve been following Roz Wound Up – a wonderful blog about book-binding, art journalling and art in general. 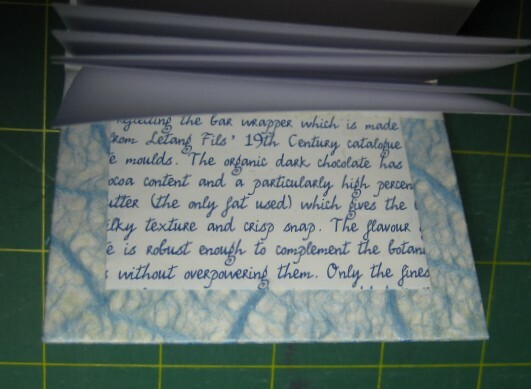 I have learnt so much from that blog, and it has helped keep my urge to journal alive over the past few months, even though I know my journal(s) will only include my first baby steps at art, nothing like Roz’s sketches. I can still aspire to reaching something near to that level one day, though, with enough practice, and meantime it will, I hope, at least chart my progress. 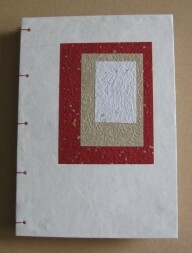 Roz has embarked on a project to get herself sketched in as many other artist’s journals as possible. To that end, she has started a contest with her handmade books as prizes, which will run for over a year. You can read about it by clicking here or on that new sidebar button. For Phase 1, entrants have to sketch her from life, which rules out those of us who don’t expect to be in Minneapolis or any other place she might visit over the next year, so she has kindly created a secondary contest for us. Also, Phase 2 will give anyone who wants it an opportunity to sketch her from photographs she will post online. Check it out – even if you don’t enter the contests, you could probably learn a lot by browsing her archives and her pages. 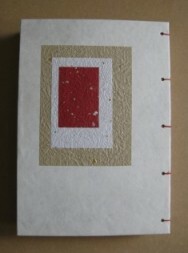 Another small journal, for a friend this time. 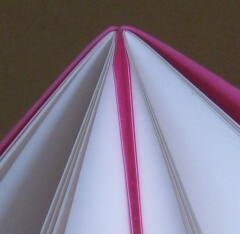 I think I am on a black & white & bright kick after using that colour scheme for quilt blocks for a swap. This one is 3″ x 4.2″ x 0.5″. 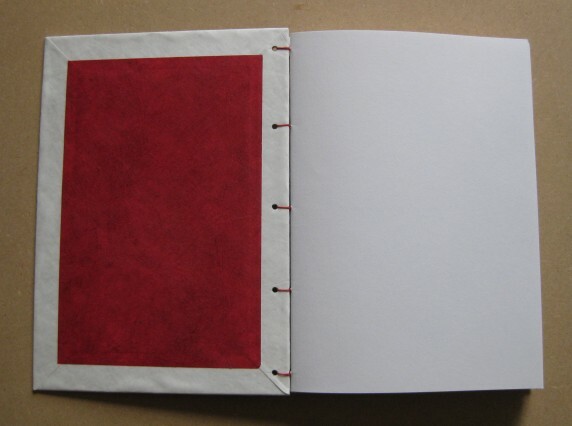 It is coptic-stitched, with 7 5-sheet signatures of 5.6″ by 3.9″ 90 gsm printer paper (well, 3 sheets are red paper of similar weight). The cover is stamped Tyvek again, and the thread is Anchor #20 crochet cotton. 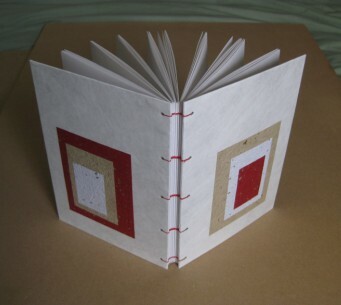 I’ve made the smaller mini-journal which I mentioned yesterday. 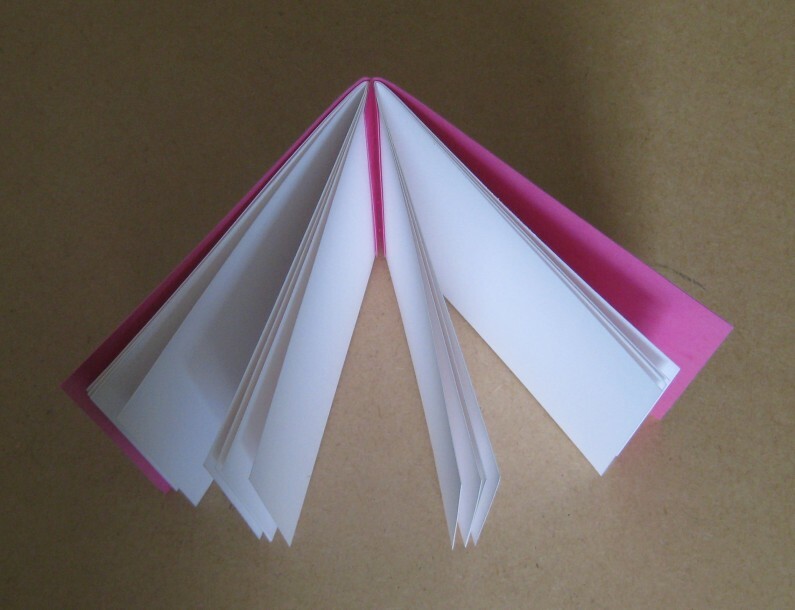 It’s 1″ by 1″ (the minimum size for the swap), with 5 2-sheet signatures. 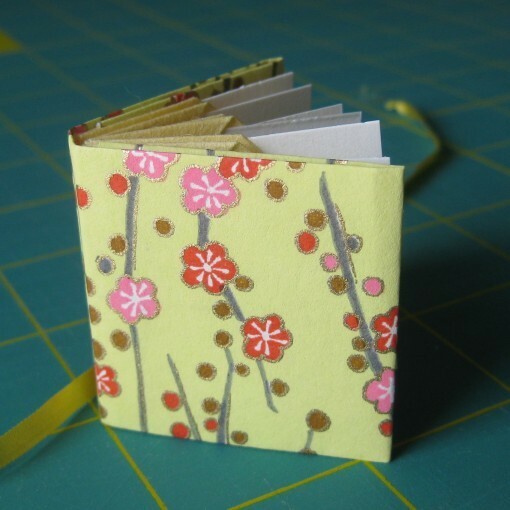 Another small journal, this time for the swap-bot “The Coptic Stitch” group “Size Challenge #1″ swap. The journals must be no bigger than 3″ in either direction. This one is 3″ by 2.3″. 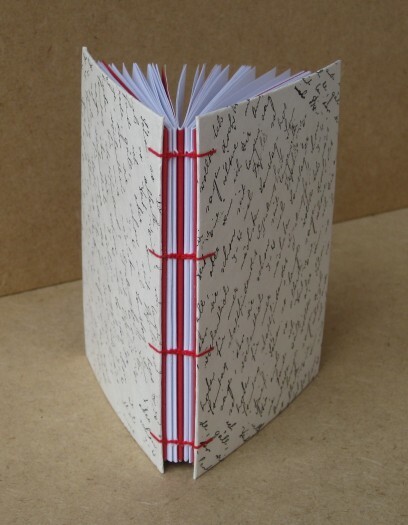 I’m going to make a much smaller one for my partner, but that will be too small to be usable, so I thought it would be nice to make her one that is only just inside the size limit too. 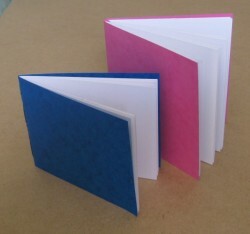 This book has 5 signatures, each 5 sheets of 90gsm paper. 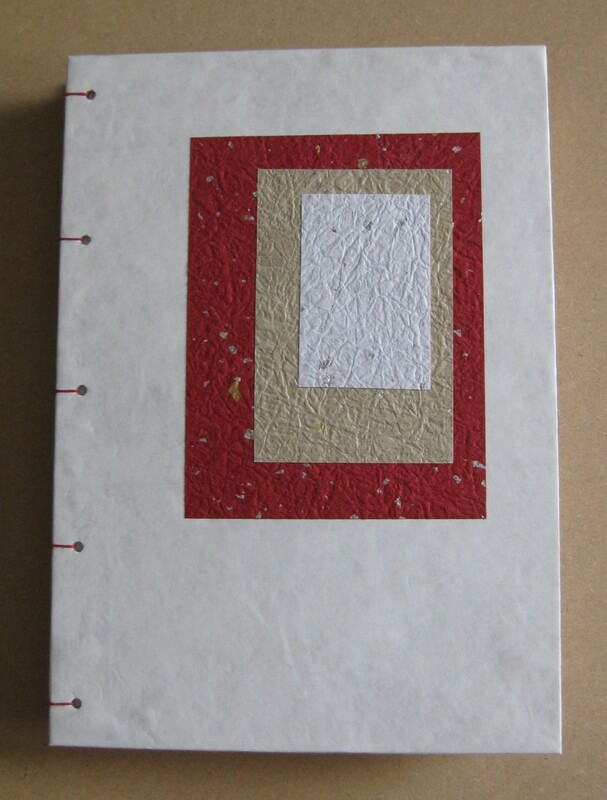 The cover is a Japanese paper called Ukigumo, which is waterproof and can be heat-fused to the background surface. 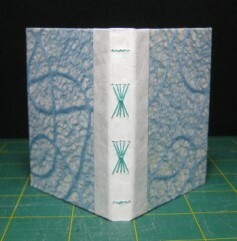 The spine is Tyvek lined with mull fabric. The sewing thread is Gutermanns Sulky Cotton 12. The inside papers for the covers were cut from a Rococo chocolate bar wrapper. 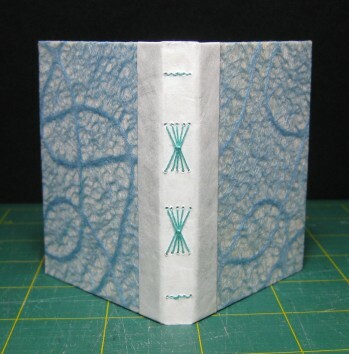 Well, I did almost finish this yesterday, but the last stage was the Coptic binding, and I decided I needed to wait for the glue smell from the covers to go away before I tackled that. 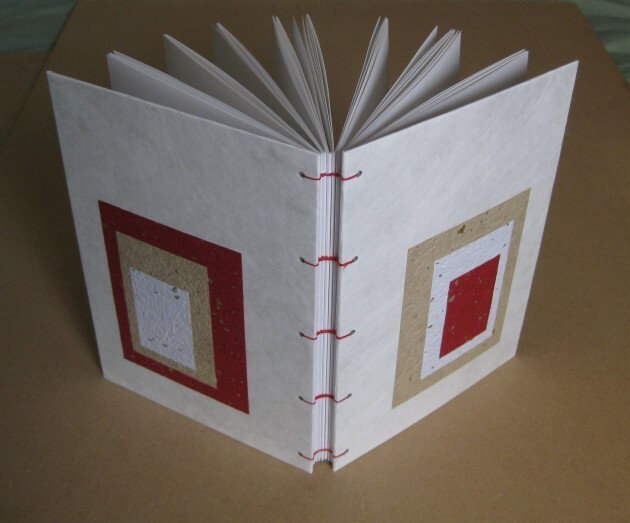 This journal is for a Colour Challenge swap in the swap-bot Coptic Stitch group (which covers all handbinding of books, not just Coptic stitch). 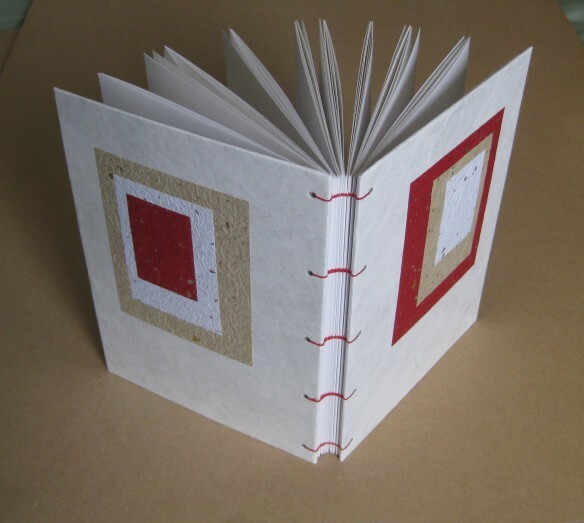 This time, the colour is red, so this journal has my favourite red ginburi momigami paper on the cover (very textured, with flecks of gold and silver foil), red lokta paper for the inner cover and red 18/3 linen for sewing. 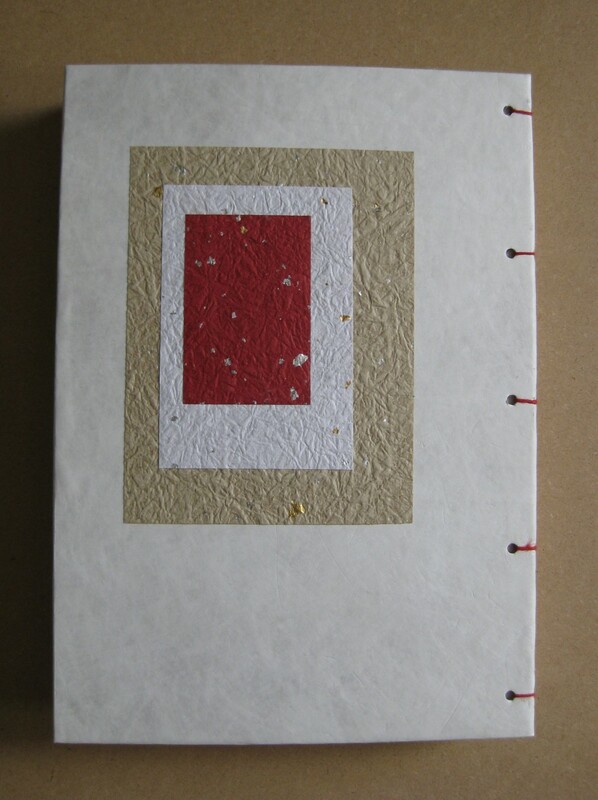 The cover boards are covered with white Tyvek, which gives slight texture and sheen as well as being durable, with 3 colours of the ginburi momigami paper. 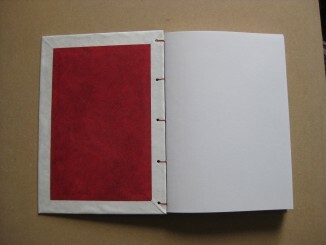 The journal has 9 signatures, each with 4 sheets of 130gsm A4 short-grain book paper, and the whole book is 6″ by 8.5″ by about 0.8″. It will be up to the new owner to decide which is the front and which is the back, but I prefer it as in the first picture. You can click on the pictures for bigger images which show the textures better. 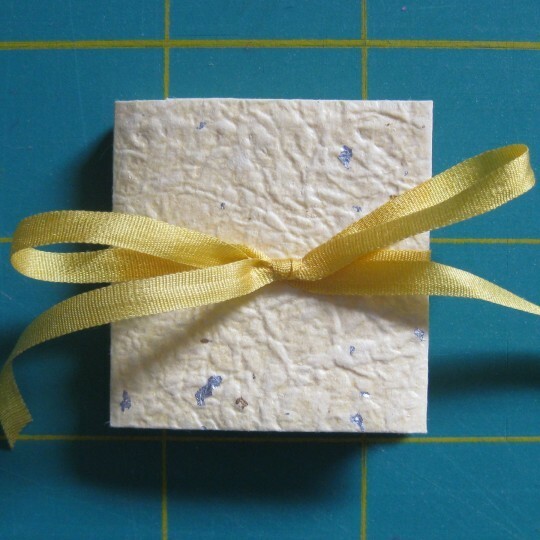 Before I get on to what I am doing today, I want to mention that a friend from Swap-bot, lisajhoney, is doing a blog giveaway. 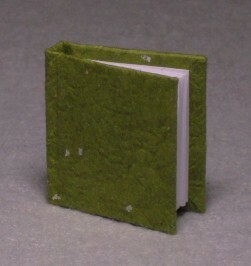 She makes wonderful felt food and other felt items. The giveaway runs till September 2nd, but if you are reading this too late, please visit her blog and Etsy shop anyway. So, back to me … today I am making mini-book charms for a series of charm swaps on Swap-bot. 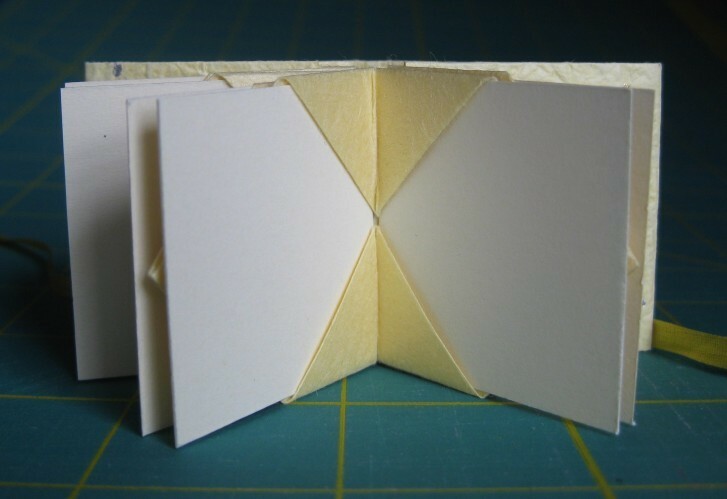 I made the first one a few weeks ago using traditional sewn signatures (groups of folded pages), but cutting the pages accurately enough for such a small book is a slow process, so now I am experimenting with mini accordion books. If this works out, I’ll post pictures soon.